MIAMI, FL--(Marketwired - March 17, 2015) - Global VSAT and terrestrial communications solutions provider Emerging Markets Communications (EMC) is showcasing their patented VSAT technologies and fully managed satellite and terrestrial communications solutions at SATELLITE 2015, the leading conference and tradeshow for the satellite industry, from March 17th-19th in Washington, D.C. Visit EMC at booth #8064 on the main exhibit floor. SATELLITE 2015 is the premier conference focusing on satellite communications, allowing attendees to discover the latest technologies and solutions available in the global marketplace. Hosted at the Walter E. Washington Convention Center in Washington, DC, Satellite brings together over 12,000 satellite industry professionals and offers attendees the opportunity to learn from and deliberate with thought-leaders in military/government, commercial, broadcast, maritime, mobility and telecommunications verticals via various panels, roundtables and user discussions. "We are continuing to make investments in technology and new services to meet the every-changing satellite communications requirements of our customers in maritime, oil and gas, global enterprise and the NGO community," said Abel Avellan, CEO of Emerging Markets Communications. "SATELLITE 2015 presents an opportunity for us to showcase our new developments and technology with key decision makers in the industry," he said. EMC will be showcasing its patented SatLink VSAT modems at SATELLITE 2015. These high-throughput modems use TDM/TDMA to offer instantaneous bandwidth-on-demand with IP data throughputs from 128 kbps up to 150 Mbps per VSAT. Capacity is allocated dynamically from a dedicated capacity assigned to a given customer or group of VSATs, which can be managed directly by the carrier using SatLink's VNO portal. These modems are built using industry leading DVBRCS2 technology, delivering the highest possible link reliability and bandwidth efficiency despite interference events or fast changing environmental conditions, such as rain, even in Ku and Ka band. IP routing, TCP Acceleration and many QoS features are built-in. A variety of SatLink® units for both onshore and offshore use will be on display, so visit EMC at SATELLITE booth #8064 to learn more. To schedule a live meeting at SATELLITE 2015 with one of our representatives please contact sales@emc-corp.net or click here. The company operates in 150 countries, with 43 global field support centers and infrastructure of teleports and terrestrial pops in the US, Europe and Africa. Emerging Markets Communications® is financially backed by ABRY Partners; a firm specialized in funding the communications industry with $36 billion of completed transactions. EMC Satcom Technologies, a division of Emerging Markets Communications, LLC, is a global satellite technology company specializing in delivering network products and solutions for the telecom industry, ISPs, governments, financial and industrial enterprises with locations in challenging and underserved areas of the world. EMC Satcom Technologies provides complete IP based satellite network systems, under the SatLink® brand, compliant with DVB-S2 and DVB-RCS2 standards, which operate in all satellite bands. Other products include the bandwidth saving Noise Reduction System (NRS), the PowerBooster and MEO Booster, HDConnect, and SpeedNet, a zero-latency browser for use over satellite. These products are in use globally and serve end-users with fixed and mobile communication requirements. R&D for EMC Satcom Technologies is based in Norway. For more information, call 1+305-539-1358 x 2288, email sales@emc-corp.net or visit http://www.emc-corp.net. 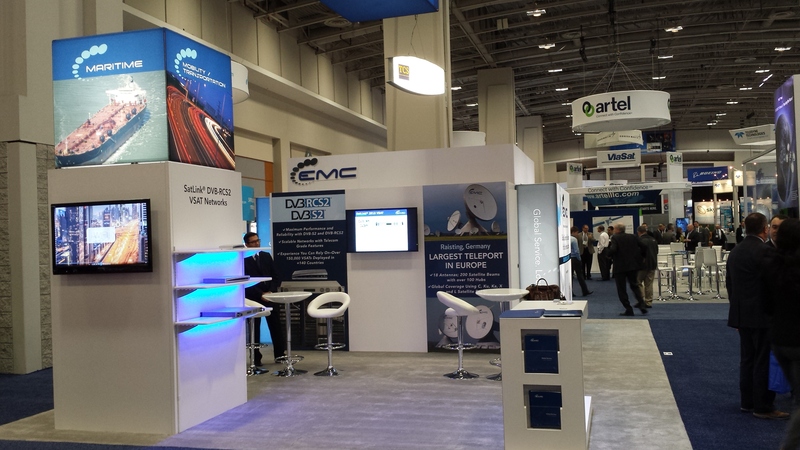 EMC's Booth # 8064 at Satellite 2015.